Marine Strip is a powerful water-soluble paint and anti-fouling stripper designed for marine uses which can remove up to 8 coats in just one application. It is perfect for use on boat gelcoats as it’s gel consistency means no drips, even on vertical surfaces. It is safe to use on virtually any surfaces including wood, plastic, metal and GRP and it makes stripping even intricate detailing a doddle! As it’s water-soluble, Marine Strip can simply be rinsed away with water using a pressure washer and it has an active working time of up to 12 hours meaning it doesn’t require constant supervision and immediate removal as some products do. It is VOC free and non flammable, so Marine Strip is safe to use in poorly ventilated or confined areas. Marine Strip is not effective on 2 component, baked-on paints or polyurethane paint and varnish. 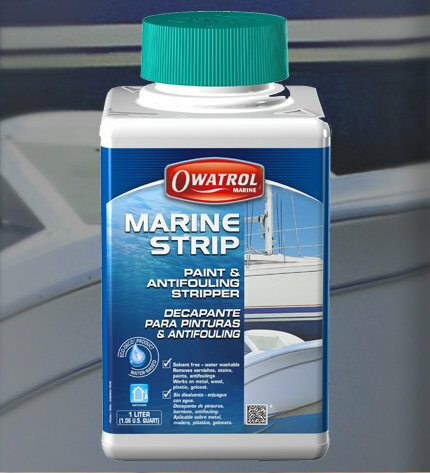 Marine Strip is a must-have for all boat owners, a powerful but easy to use paint stripper for almost any surface on your boat.